It is standard enterprise practice to make users to change their password at every 30 days or so. No doubt it is really a good practice but it can cause some funny issues if you have applied same password expiration policy to service accounts or to accounts which are basically used to perform some sort of “extra” work. And so, when the moment comes and that password dies out, you have to be sure that you change it (and remember the new password … again !!) without fail, because otherwise that service will not work at intended or worse fail to even start. The Report Server Has Encountered a configuration error. 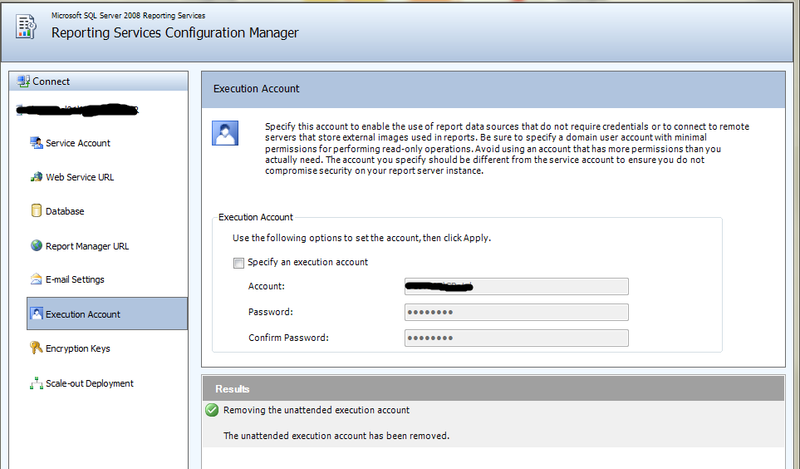 Logon failed for the unattended execution account. (rsServerConfiguration Error). 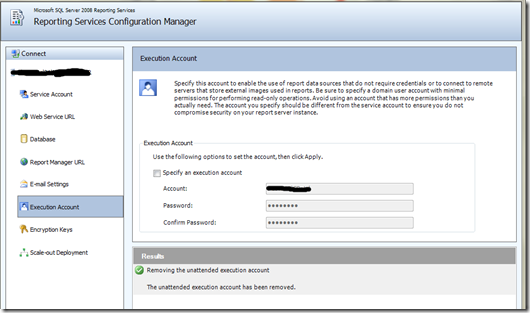 This entry was posted by Gaurang on December 11, 2010 at 6:38 pm, and is filed under SSRS, Tips, Windows. Follow any responses to this post through RSS 2.0. You can leave a response or trackback from your own site.